New York City Department of Environmental Protection (DEP) Commissioner Vincent Sapienza today joined with community leaders and environmental advocates to announce substantial progress on more than $200 million in ecological improvements for Flushing Bay. Work includes the ongoing construction of more than three acres of new wetlands that will naturally filter the water in the Bay, the recently completed dredging of 89,000 cubic yards of sediment, and an upgrade of the sewer system that is preventing 225 million gallons of pollution from being discharged into the Bay each year. Reducing the volume of sewer overflows, removing built-up sediment that would become exposed during low tide and create nuisance odors, and restoring the natural wetlands to help filter impurities from the water has resulted in a visibly healthier waterway for residents to enjoy and a more hospitable habitat for fish and wildlife. Over the last 150-years, New York City has lost approximately 85 percent of its historical wetland coverage, much of this within the Flushing Bay watershed. These important natural areas serve as a protective transitional area between a body of water and dry land. Wetlands are extremely valuable as they help to absorb storm surge, filter impurities from the water, increase dissolved oxygen levels, reduce coastal erosion, capture greenhouse gases and serve as a productive ecological habitat and nursery for juvenile fish. Wetlands are among the most productive natural areas on earth and are particularly important in urban waters. In an effort to return some of these natural functions to Flushing Bay, in 2017 DEP began a $19.2 million project to construct more than three acres of new wetlands along the southern shore. This work included the placement of more than 53,000 cubic yards of wetland sand, shoreline embankment material and granular filter, as well as the planting of more than 110,000 plugs of Switchgrass, Saltgrass, Seaside Goldenrod, Smooth Cordgrass, Saltmeadow Cordgrass and Common Three Square. The planting and monitoring of the wetlands will continue for the next several years. The $15.4 million project to dredge portions of Flushing Bay in the vicinity of the World’s Fair Marina and two combined sewer outfalls began in January 2017 and was completed the same year. This work has significantly reduced nuisance odors in the area. Long-reach excavators situated on floating barges dredged 91,000 cubic yards of sediment over a 17.5 acre area. In addition, non-native trees, 78 deteriorated timber piles and an abandoned pier were removed to improve views along a portion of the 1.4-mile long Flushing Bay Promenade. The $33 million subsurface sewer upgrades took place at five key junction points within the sewer system between LaGuardia Airport and the Long Island Expressway. The work focused on raising and lengthening the weirs that direct the wastewater to the Bowery Bay Wastewater Treatment Plant. By directing additional wastewater to the treatment facility, this project has reduced sewer overflows into Flushing Bay by 225 million gallons annually. The work began in the spring of 2016 and was completed in the spring of 2018. As some of the work required closing portions of busy roadways in order to access the subsurface sewer regulators, crews often worked during the overnight hours to minimize any inconvenience to motorists and residents. Work began in 2016 on a $132 million project to separate the existing combined sewer system in College Point and permanently decommission three combined sewer outfalls on the eastern shore of the Bay. This will result in a nearly 50 million gallon reduction in sewer overflows annually. The construction of more than 400 new catch basins, nearly 12 miles of new sewers and nearly 10 miles of new water mains will continue through 2021. Existing wetlands in the vicinity of MacNeil Park will also be expanded with the planting of an additional 10,000 square feet of Saltmarsh Cordgrass. In the Flushing Bay and Flushing Creek watersheds, DEP has built more than 1,250 green infrastructure assets over the last five years. This includes curbside rain gardens that collect and manage stormwater before it can ever enter the combined sewer system and contribute to overflows. The work is primarily taking place in the neighborhoods of Corona, Elmhurst, Forest Hills, Rego Park, Middle Village, Flushing and Murray Hill. Assets also include the newly opened JHS 189 Flushing International School playground that was retrofitted to capture 860,000 gallons of stormwater per year, vastly improving the health of Flushing Creek. Siting for the construction of additional rain gardens and planning for new green playgrounds is ongoing. In addition, in 2009, DEP activated the $291 million Flushing Bay Combined Sewer Overflow Retention Facility. The tank can hold up to 43 million gallons of combined sewage from central Queens and hold it until the storm passes. The sewage is then pumped to the Tallman Island Wastewater Treatment Plant where it is cleaned. 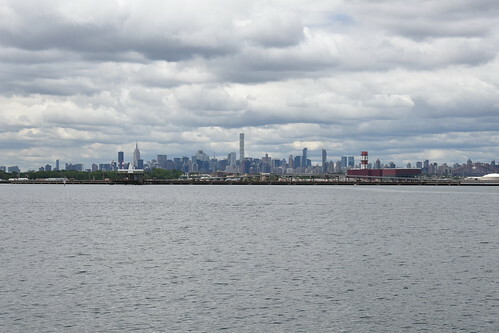 The sewer optimization, environmental dredging, wetland construction and green infrastructure projects are part of agreements between DEP and the New York State Department of Environmental Conservation that aim to improve harbor water quality throughout New York City.